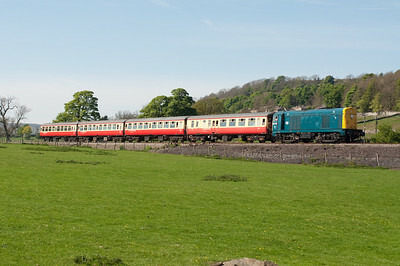 20020 hauls the 11.20 ex Redmire east of Leyburn 24/4/11. 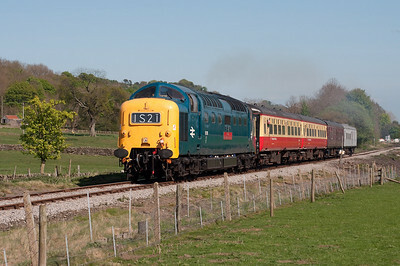 20020 departs Leyburn with the 13.00 Leeming Bar-Redmire 24/4/11. 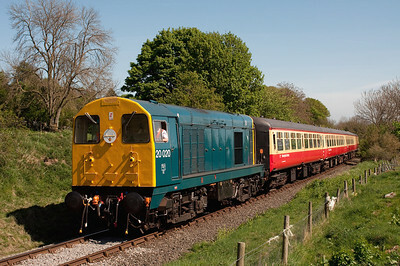 Running nose leading 20020 departs Redmire on the 11.20 to Leeming Bar 24/4/11. 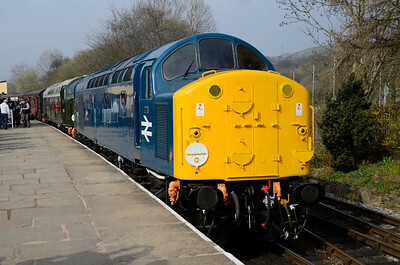 55019 heads the 14.45 from Leeming Bar near the former Wensley station 24/4/11. 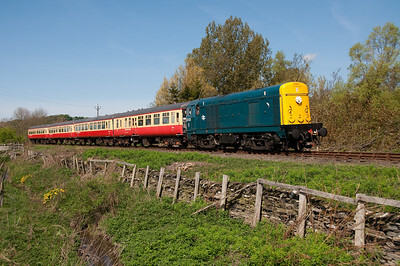 20020 passes Preston-under-Scar with the 14.41 Redmire-Leeming Bar 24/4/11. 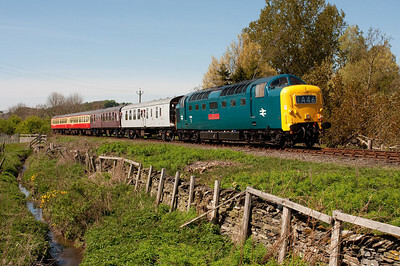 55019 passes Harmby with the 14.45 Leeming Bar-Redmire 24/4/11. 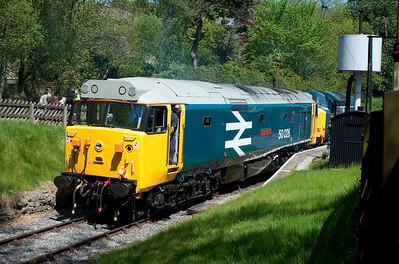 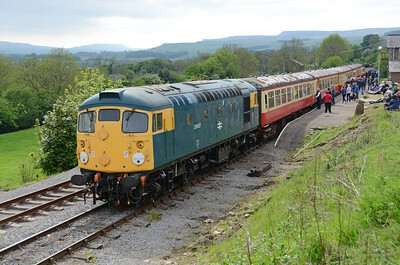 55019 departs Leyburn with the 13.00 ex Redmire on Easter Sunday 24/4/11. 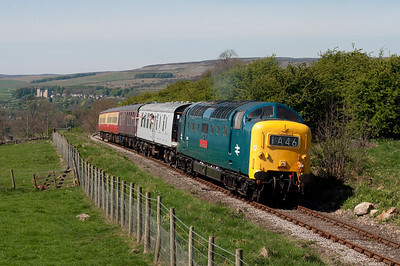 With Castle Bolton in the distance 55019 climbs away from Redmire with the 13.00 to Leeming Bar 24/4/11. 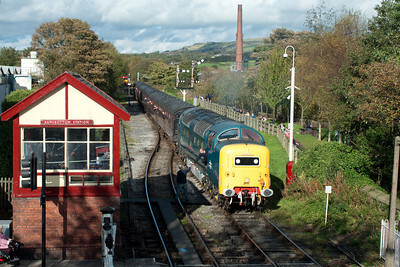 55022 "Royal Scots Grey" approaches Ramsbottom with the 14.26 Rawtenstall-Heywood 16/10/11. 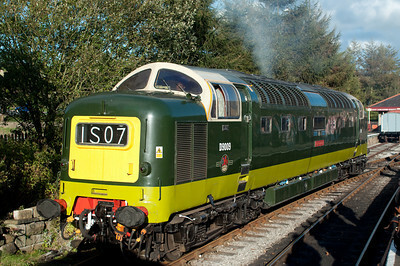 D9009 "Alycidon" runs round its train at Rawtenstall 16/10/11. 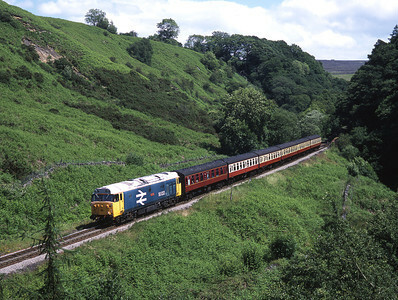 50033 "Glorious" heads north at Thomason Foss on the North Yorkshire Moors Railway 27/6/04. 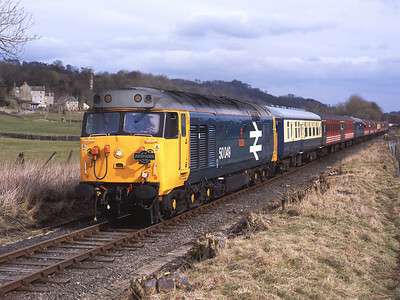 50049 "Defiance" leads a Pathfinder tour from Cardiff at Preston-under-scar on the Wesleydale line 25/3/06, with 50031 on the rear. 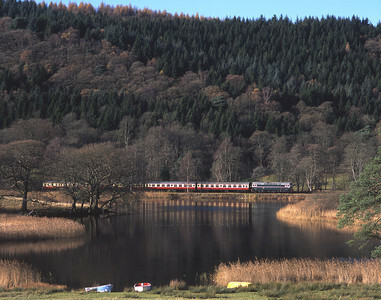 Immaculate 37003 passes the former Wensley station near Redmire 20/8/05. 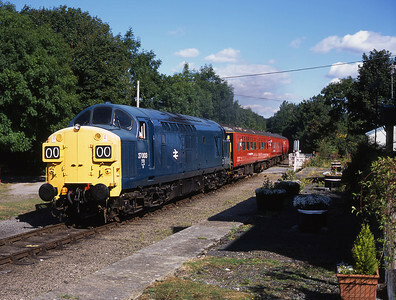 A special from Darlington-Redmire nears its destination with 31452 on the front and 31128 on the back 23/9/06. 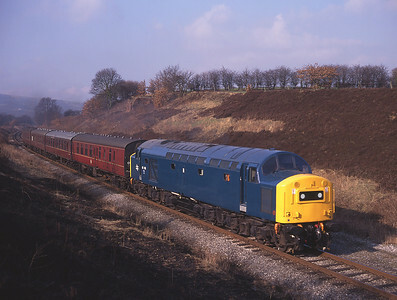 A pair of class 03 shunters D2117 and D2072 approach Haverthwaite from Lakeside during a diesel gala 11/11/07. 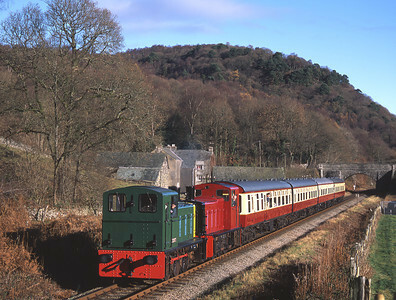 Class 03s D2072 + D2117 depart Newby Bridge halt on the Lakeside & Haverthwaite Railway 16/11/03. 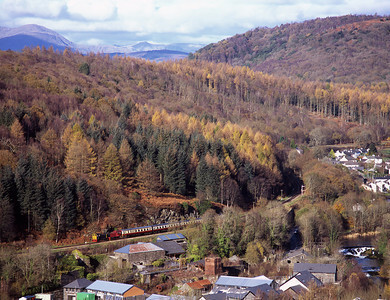 Class 26 D5301 approaches Lakeside with a train from Haverthwaite 16/11/03. 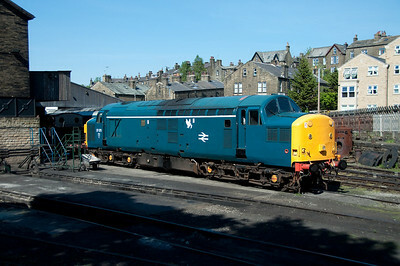 37075 basks in the sun outside Haworth shed viewed from a passing train 27/5/12. 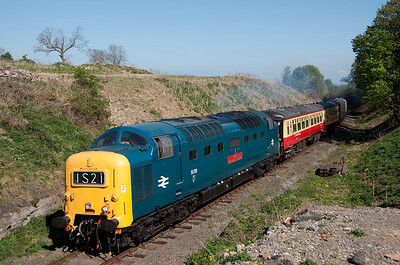 During the KWVR's excellent diesel weekend 50026 + 37075 depart the headshunt at Oxenhope 27/5/12. 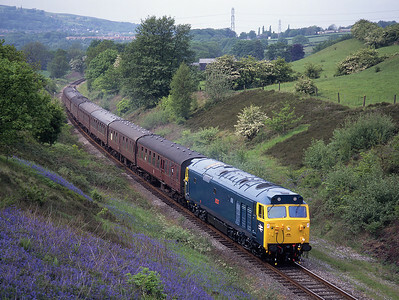 50015 "Valiant" passes a carpet of bluebells in Burrs cutting on the East Lancs Railway 6/6/96. 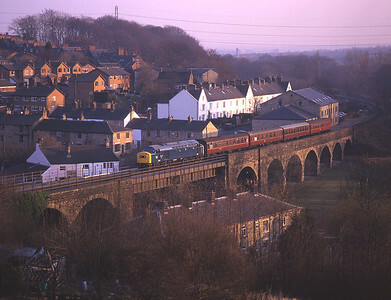 In fading light 40145 crosses Brooksbottom viaduct, Summerseat 9/3/96. 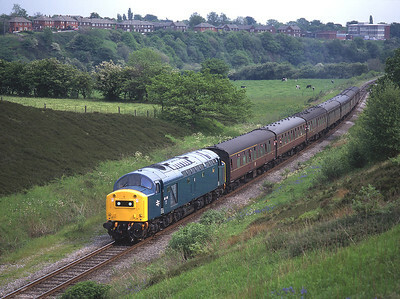 40145 passes Burrs on the ELR with a northbound train 6/6/96. 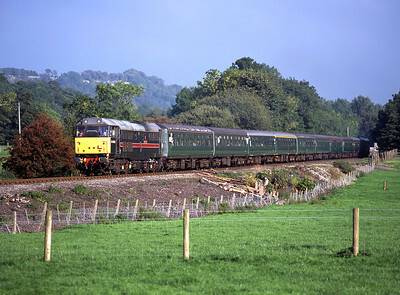 Pristine 40145 passes Burrs cutting on a southbound train 9/3/96. 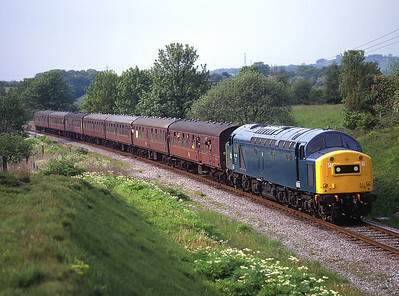 40145 is seen at Little Burrs on 6/6/96. 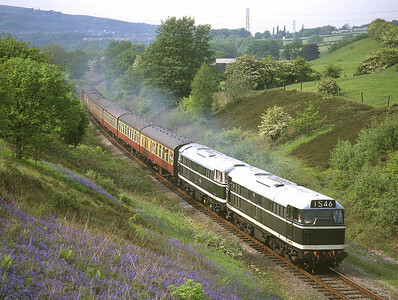 D5518 + D5500 pass the bluebells in Burrs cutting 6/6/96. 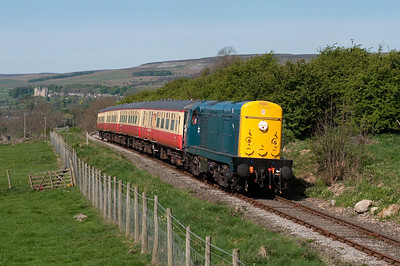 26007 stands at Redmire about to work the 16.00 to Leyburn with 37059 on the rear on 29/5/16. 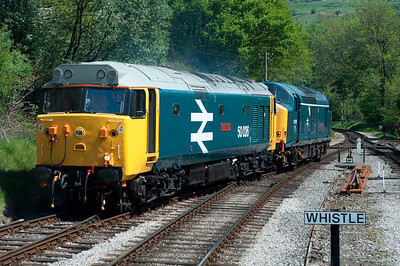 40012 "Aureol" + D213 "Andania" after arriving in Rawtenstall with the 09.20 from Bury during the 40s @ 60 event on 15/4/18.